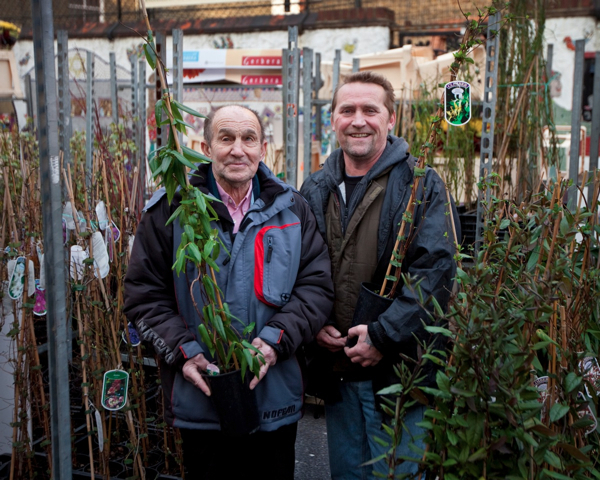 Alongside George Gladwell, the other trader who has been in Columbia Rd the longest is Louis Burridge – widely known as Lou – pictured here with his son William – widely known as Billy. He is celebrated as the preeminent supplier of climbers and creepers, clematis, honeysuckle, passionflowers and vines, that adorn the gardens of the East End. Yet, although Lou started trading in the late forties, I discovered that the story of the Burridges, the family who are regarded as Columbia Rd nobility, begins even further back in the last century. Today, Lou is the head of the extended Burridge clan, whose members you find trading along the length of Columbia Rd.“My five brothers gradually got into it and they all had stalls, and then you’ve got their sons, and their sons – so you’ve got all the family.” he declared in joyful tones, “We all get together for birthdays and that. I’m seventy, and I suppose there must have been a hundred people at my birthday party. We all get on pretty well. Some live in Hertfordshire, some in live in Rayleigh, some live in Southend. “I’ve always loved market work. It’s a funny thing growing plants and selling them, because you get very interested in them, people who sell wholesale plants in supermarkets have no idea. - This is life.” he said, with a sprightly smile of pride, before springing up from the wall, eager to return to his pitch, because he could no longer resist the magnetism drawing him back to the site where his father started in 1922. Approaching Columbia Rd from the West today, or at any time in the last sixty years, you would see the Harnett’s plant stall to your left and Albert Dean’s flower stall on your right, and then Lou Burridge’s stall, another pitch down from the Harnetts, also on the left. There you find Lou – slight of stature yet bright of spirit – presiding every week among a forest of cherished specimens of climbers that are as tall as he is, with the rare experience of a plantsman born and bred. 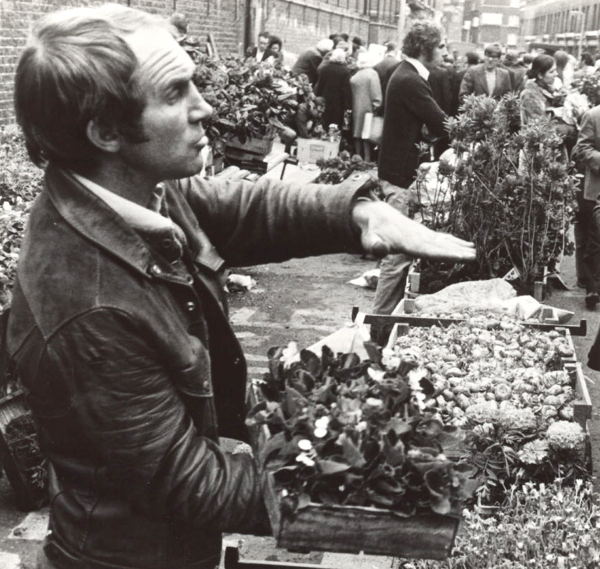 George Gladwell’s picture of Louis Burridge trading in the same spot in the early nineteen seventies. It’s such a small world. My husband used to go to school with Billy Burridge in Upminster. I don’t think he has seen Billy for about 20 years…the last timet a chance meeting at Columbia Road market, I can’t wait to show him this post. oh THANKS! That was l-o-v-e-l-y. Now I want to be Lou Burridge when I grow up. Not so bad, devoting your life to clematis and passionflowers. I’m so glad to see this about Lou Burridge! It’s great that he’s still going at the market like his Dad before him. And so are more of the Burridge clan now from what he says of his five brothers’ families – brilliant! Like him, I come from the big family of Burridge fish dealers at Portsmouth & London – but didn’t get to grow up in either place. His Dad must have been my dad’s cousin.